Why should I learn Python? Are there any advantages to learning Python over other languages? It’s one of the most popular programming languages with a massive community. This means help is readily available when you’re stuck! It’s used in many fields and industries, like Web development, machine learning and AI, and data science, just to name a few. So once you learn the fundamentals, you can grow into the role of your choice! Python is one of our most popular courses and is only getting more so. 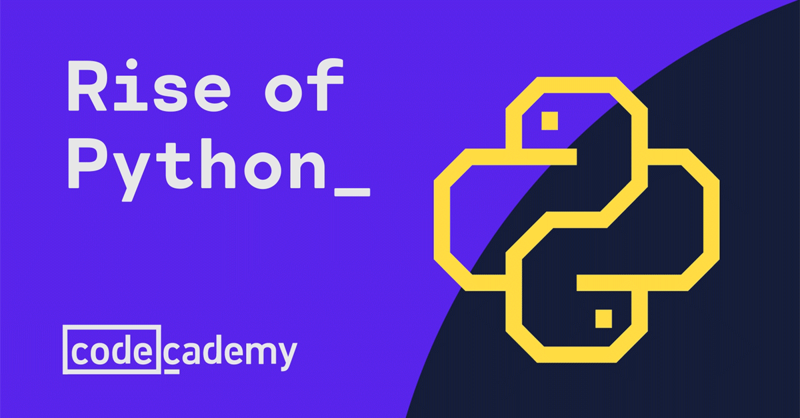 We covered the rise of Python in our Codecademy blog, check it out to learn even more about why Python is so popular. Python was the fastest growing programming language in 2017. Surprisingly, its newest fans include business majors, analysts, and content marketers. Here’s why. Do you have any insights into why people should learn Python? Share them below! FAQ: Learn Python - Python Syntax - Hello World! You cannot do that in Python 2. Whether you want to go for Functional programming or OOPs, Shell scripting or interested in Web Development, Desktop related app or Network related the one best choice we have is python. Because of its modularity, it becomes popular. But of course it is possible, using encoding and decoding. I was forced to mess with that evil when I was writing a Chinese Shanghai weather bot for Twitter years ago. I feel that Python has incredibly fast development times. I enjoy the fact that I can pop open notepad and have a decent script up and running for my work in minutes not hours. One of the most useful languages with innumerable amounts of documentations. when you begin to understand the process of programming and the language. Python is really great for learning base computer programming concepts. I at least know in my experience in my coding class it was the easiest one for everyone to really jump into and learn. Coming from a newbie it really made it easier to adjust. Well this analogy about why leanr python with that example its not exacly true… for example you can use php and use echo ‘A’; instead of print(‘A’) or directly println, in other commands. But well ok learning python is fun. This is a bad way to compare the languages. Off course, the Python code is more short and friendly, but this language don’t give us the control and usability of more robusts languages like Java and some others. well, you are right but i would phrase it a little bitter. Java is a more verbose language, but has absolutely proved its worth as an industry strong language, its strongly typed, vast ecosystem with great (deploy) tools and much more. It’s verbose in annoying way, but it’s what you said. Both languages have your advantages, each one in your proposals and goals, the discuss go beyond one print() and a System.out.print() hahaha. I like more Python, by the way. Plus there’s always PyGame if you want to go into making games, that’s also based on Python 2, at least it was last time I used it! because it is used to in many fields like data science , machine learning , app mobile , and web develop . Regardless the language you choose or are convinced to learn, what is the field of your endeavor? That should be what determines your immediate learning need. Some fields are rife with Java code, others C++. Some fields are ripe for the taking with Python, such as robotics and controls. Pick your field, then choose the language that has the right fit. If Python is the right fit, then bring it on. Back in the day, I chose JS as the language to learn. Then it branched to PHP. All I did was solve my own problems through that whole process, and came about with some pretty cool code. It’s all gone now. Cassini has crashed into Saturn. Make whatever you write mean something in its day. Hi, To be fair to py 2. I was only 5 mins into coding with Python and came across this issue. The error message is so specific and I got a solution straightaway by following the link. Other languages like Java, or especially C++ may give more control over many low-level aspects of programming (‘closer to the machine’ is one way to say it) but they are not necessarily more “usable” than Python, as you write. As for being more “robust” (there is no “s” at the end) this means strong, healthy and in computer terms it often means less likely to malfunction or crash due to being stressed or pushed to the limit. And in this sense I don’t think Python is any less robust than Java, and it probably depends far more on the specifics of a given program, like how well and how professionally it is coded. Of course, no language can provide the low-level control of Assembler, which is limited only by the capabilities of the CPU and its instruction set (e.g. Intel x86, Oracle/Sun SPARC, IBM POWER8, etc.). I just started to learn Python. I know PHP well and out of curiosity, I start a new programming language. We’ll see if I can get to know him well. The syntax seems simple. Hi there. I also would like to learn Python and I also heard that it is easy language compared to Java for example. What do you guys think about it?